THE REVIEW: There’s been a lot of buzz building up to this year’s Academy Awards about Julianne Moore’s performance in Still Alice. She is about as sure a lock as you can possibly be for winning the Best Actress trophy and given that there’s still a few hours left before the awards show starts, I figured I’d see what all the hubbub is about. Having seen Moore’s work for myself, I can now join the chorus in applauding her for a deeply emotional, nuanced, and tragic character. Tragic wouldn’t be a word that Alice Howland would use to describe herself because, as she notes during a speech at the Alzheimer’s Association, “I’m not suffering. I’m struggling.” For us as the audience though, it is tough to just watch her deterioration unfold and not be able to do anything about it. As you most likely know already, especially after I mentioned the Alzheimer’s Association, that Alice’s character is diagnosed with early onset Alzheimer’s disease. She is a widely respected professor of linguistics at Columbia University who starts out forgetting small things like a specific word in her speech at UCLA but gradually develops to a point where she forgets locations around the house and people’s names. Her family — consisting of her husband John (Alec Baldwin), daughters Anna (Kate Bosworth) and Lydia (Kristen Stewart), and son Tom (Hunter Parrish) — is caring and considerate of her disease. While Alice is obviously the main focus, seeing the family go through this situation is also quite difficult to watch. During a conversation, Alice may ask for something repeated multiple times and everyone consistently asks like she’s asking for the first time instead of reminding her she has Alzheimer’s. Seeing their faces and reactions is part of the pain. There’s nothing they can do but be caring and supportive as they watch Alice slowly drift away. Moore’s performance is so noteworthy and deserving of an Oscar not just because of her portrayal of Alice at the very end, but because of the progression Alice takes throughout the film. It is seeing Alice’s decline piece-by-piece instead of in one fell swoop that is impressive. Sure, the final scene with Alice and Lydia where Alice can barely speak is heartbreaking and it shows the subtlety that Moore brings to the character. But it’s also moments like her recording the video for her future self, or confronting John about her disease. In these moments Alice is fully aware of herself and is a “normal” human being. But she knows she has Alzheimer’s and she know it will only get worse, and that inevitability scares her and shines through even at the beginning. On the opposite side of the scale, Moore brings the glimmer of hope and a shadow of her past self to the Alice that has all but faded away and cannot remember who that person was. It’s not because of the grand strokes and seemingly accurate physical depiction of someone with Alzheimer’s, it is Julianne Moore’s ability to convey the mental state — how she “feels” — that is impressive and groundbreaking. 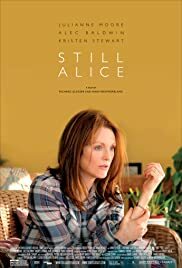 THE TAKEAWAY: Still Alice is really a film about the performances and the journey the Howland family goes through over the course of the film. Julianne Moore’s performance is certainly the most notable of the bunch and she will probably be receiving the Best Actress Oscar for her hard work. But everyone in the cast really brought their A-game including Alec Baldwin and Kristen Stewart, who delivered really great supporting performances as John and Lydia. The ending felt a bit rushed and it would have been nice to see a little more of Alice’s final stages, but overall, the film told the story it needed to.